With just a few craft supplies and candies, your child can create a cheery craft foam gingerbread house like the one Mrs. Claus was making in the story, “Everyone�s Important.” For more festive fun, your child can decorate additional houses to create a little village! Print the template and cut out the house. Trace house pattern onto foam using pencil (or marker) and then cut out. 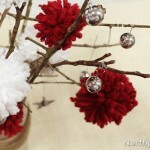 Decorate house with candy, pompoms, pipe cleaners, glitter—whatever you like. Now you have gingerbread house just like Mrs. Claus!